What is the Beach Price Index? How expensive is my vacation? For most of us, the word "vacation" brings a clear connotation to sunlight, sandy beaches, and wonderfully blue water to swim in. Choosing a seaside destination is tricky, though - quite often, hidden gems are not described in traveling guidebooks, while the most expensive beaches don't provide the best experience. 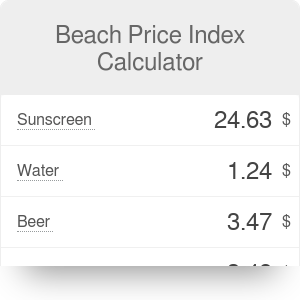 Our Beach Price Index Calculator helps you find out whether the location you're headed to is cheap or pricey in comparison to other beaches around the world. Curious? Let's dive right in! Sunscreen cost: it is the average cost of a 200 ml SPF 30 bottle bought from a store in local resort or hotel, a hostel, and local pharmacy or supermarket. Water cost is merely the price for a 500 ml bottle from the three largest local brands from a store in a local resort/hotel, a hostel, and local pharmacy or supermarket. Beer cost is an average between the domestic beer prices and the retail value of Heineken, Budweiser, Becks, Guinness and Fosters at local prices. Ice-cream cost is the average pre-packaged branded ice-cream price in the capital city. Lunch cost is the average full meal cost, including a drink and dessert, for one person from a beach bar or a hotel or restaurant located close to the beach. Facility fee amounts to the potential entrance fee to the beach, in addition to the cost of renting a sun lounger and an umbrella for one day. TravelBird's ranking analyzes 327 beaches all over the world in full detail. However, it is highly improbable that they have listed every single beach on the planet. This is where our tool comes in. After inputting the six parameters mentioned above, you will find out what is the Beach Price Index of your destination. We also compare the total cost of a one-day stay at the beach you've chosen to the ones in the ranking. This will give you a clear idea of how expensive your vacation will be - if, for example, your dream beach would rank fifth out of 327 beaches, it might mean your expenses will be exorbitant! If it turns out the beach you're going to ranks a bit too high for your liking, you have two options. You can, naturally, choose another destination. Is it worth giving up on your dreams, though? If not, then make sure to take a look at our Dream Come True Calculator to check how long you need to save for your vacation. Beach Price Index Calculator can be embedded on your website to enrich the content you wrote and make it easier for your visitors to understand your message.